Noi organizzare per le indicazioni e altre informazioni utili per essere inviato a voi. Un pacchetto di benvenuto con latte, pane e altre cose essenziali sarà in vigore per il vostro arrivo. Se c'è qualcosa di specifico è necessario essere in appartamento per il vostro arrivo, per favore fatemelo sapere. Sarete accolti al di fuori del complesso di appartamenti da un rappresentante della nostra società di gestione immobiliare con i tasti. Se non stanno assumendo una macchina in arrivo, taxi sono disponibili presso l'aeroporto da pagare in loco al conducente. Se avete bisogno di una monoposto di sette o di un veicolo con accesso per disabili, per favore fatemelo sapere in modo da poter prendere accordi in anticipo. Квартира на втором этаже,хороший вид из окон. Есть все,особенно если вы едете в детьми. Интернет приличный,русского ТВ нет,поэтому смотрели новости по интернету. Есть ДВД,можно взять русские диски для детей,в квартире только на англ.яз. До моря минут 10 езды,без машины на Кипре никак. В общем,рекомендую. Beautifully kept apartment in the heart of Oroklini village. Very clean and quiet and obviously well cared for Situated within 3 minutes walk of all the restaurants, bars and supermarkets. Everything one could possibly want in the apartment and has lovely views over the surrounding countryside. We enjoyed our stay here immensely and will certainly be back!! The flat is on the second floor (with lift) of a modern block and has lovely views to the hills and the coast. The flat is spacious, light and airy, and with a large balcony. 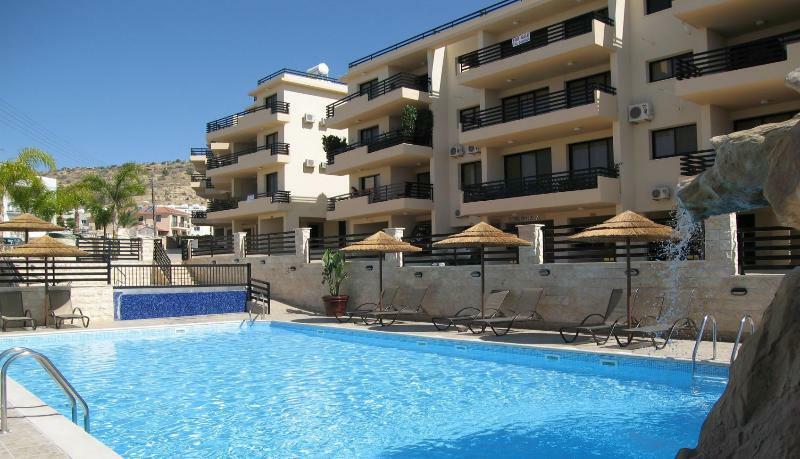 It is well situated for the airport, beaches, the village and Larnaca itself. Spent a very interesting hour in the bird hide by the lake a few minutes away. Large Carrefour supermarket in Larnaca, and several branches of Lidl (which in Cyprus sell wet fish as stunningly low prices, which they do not in UK or France), in Larnaca and a couple of the larger villages. Very clean and well equipped apartment, worth every penny, highly recommend this place, organisation getting the keys was spot on and a lovely surprise to find all the essentials you need for a late night cuppa and breakfast not forgetting the nice cool water, just what we needed after a long trip. Ten out of ten!!! The apartment was as described and communication with the owner was easy. Oroklini has quite a few grocery shops within 5-10min walk from the apartment. There are some great restaurants and take aways, plus two great bakeries, one of which is open 24hrs where you can buy milk and other last minute items. The beach is about 5mins away by car and is frequented by locals, there is a restaurant on the beach front which is very convenient. The highways are great, which means you can be in Larnaca in 30mins and Lefkosia in 45mins. Agia Nappa is about 30mins away. I would highly recommend the apartment and Oroklini if you would like a quieter holiday. I have visited Oroklini a few times before and have always admired the Med Sea View apartments for their location and was not disappointed when I finally stayed there this week. The apartments themselves are very modern and secure and are only a short walk to either end of the village to visit the restaurants, bars and shops. Our particular apartment was perfect from word go. When we arrived we were greeted by a representative from the property management company which was great as it was fairly late at night. He showed us around and advised that there was a welcome pack of essentials (milk, bread, etc), which again was very thoughtful due to the lateness of our arrival. In saying that, there is a 24hour supermarket, 24hour bakery and a late night kiosk in the village but if you are new to the village you wouldn't know that. The apartments are in a very quiet location, with no passing traffic due to the direction they are facing so a good nights sleep was had all week. The pool area was spotless and quiet most days so a nice relaxing sunbathing area. The highlight of the apartment for me was the balcony area. Ever since I booked the apartment I had wanted to sit on the balcony with a cup of tea and I made sure to do that every day. I think the heat in Cyprus was unusually hot this week (5th to 12th May), and again due to the direction of the apartment, very little direct sunlight hit the balcony which was a very welcome relief to the heat experienced when not in the shade. This also meant that the apartment very rarely felt overheated which made for a very comfortable living experience. My family and I have been visiting Oroklini for 8 years now and have seen a lot of changes but along with some modern bars, the authenticity of the traditional tavernas and houses has not been lost. We mostly visited The Only Bar, Kings Cellar. Coffee & Cava, Lithos, Verochino Cafenio, the Grada, Take&Go and the 24hour bakery during our stay. You really could go to Oroklini and never leave for the duration of your holiday, there is so much going on. I am already looking forward to booking my next visit. Thank you to Paul for making the booking experience and stay so seamless. Me and my family had a lovely time at the apartment, its is a lovely size, lovely and clean, and very quite. It was an easy transfer from the airport to the apartment, swimming pool was a lovely size and a good size childrens pool. The village is nice and quite with lots of places to eat and local shops which are walking distance. A lovely view from the balcony and safe for young children. I would strongly recommend this apartment. We would difinitely use the apartment again. The apartment is in a wonderful, quiet location in Oroklini. It is light and spacious, with lots of added extras for your comfort and entertainment. It was very well presented and maintained to a high standard; very clean, tidy and comfortable and stocked with all that we needed throughout the duration of our stay. The view from the balcony made a lovely setting for our daily meals. The location of the property is excellent - a five minute walk to the local village centre (which is a nice, traditional place) and close to some lovely tavernas and friendly local bars and pubs. There are also supermarkets and shops within easy reach. We can highly recommend the Voreas Tavern, The Grada Restaurant and the Only Bar if you want a change to alfresco dining on the balcony. If you miss the fish and chips of the UK try Lambros Fish and Chips on the Cessac Beach in Dhekelia next to the Army base. The village is only a few minutes’ drive from the wonderful beaches of Larnaca Bay and also from Larnaca itself with its lovely promenade, lots of cafes and bars restaurants and a good selection of shops There is easy access to the motorway system which allows you to access to the many places of interest on the island. We felt very at home in the apartment and will be very happy to stay there again. Booking this apartment couldn't have been simpler, any questions we had prior to and after booking were answered in a very prompt and helpful manner by the owner. The property was superb for us, with a double for grown ups and twin room for the kids spacious living area and a balcony big enough to accomodate outdoor dining on the table and chairs provided. For those with young ones, the kitchen is well stocked with utensils for their needs, we've lost count of the number of times we've had to make the kids use oversized forks whilst making sure they don't smash their plates and cups on the floor, accidentally of course! There's also a selection of childrens DVD's to keep them quiet whilst clearing up. We made use of the shared pool only on a couple of occassions, this was mainly due to the time of year which we went (late Oct), it wasn't hot enough (still late 20's though!) to heat up properly but the times we did use it, it was still fun!! The rest of the days we hit the various beaches around the island as we'd hired a car. The village itself was perfect, mixing with the friendly locals at the local eateries and watering holes, of which there are plenty, and as it's off the beaten track we found that the food was fantastic and prices were extremely reasonable in comparison to the more touristy areas. A couple of must visits are the local taverna at the top of the village(Militos), the one down the road towards Larnaca (Grada) and either of the bakeries both of which have a fabulous selection of breads, savouries and cakes. Location wise, you're bang in the middle of everything, with the beaches of Aygia Napa on one end and Paphos and Limossol the other, Nicosia just a short drive inland, all equally easy to get to either via motorway or the scenic routes along the coast. We would definately recommend this for anyone who wants something other than a packaged hotel holiday and it's certainly somewhere we wouldn't hesitate to return to. My husband and myself stayed here for the Month of February 2012 and couldn't fault it one bit. The apartment was exactly as described, very comfortable with all new and modern appliances and with everything you could want. We felt extremely safe and secure within the complex. The apartment is only a short walk to the village centre of Oroklini where there are ample shops, banks and eateries, and a bakers to die for. The people in the village are very friendly. I would highly recommend this apartment for a very relaxing stay. The communications between the owner was also excellent. Prezzo a notte stimato in base a un soggiorno settimanale. Potrebbero essere applicate le tariffe del proprietario di €116.00. Inserisci le date per visualizzare il costo totale.